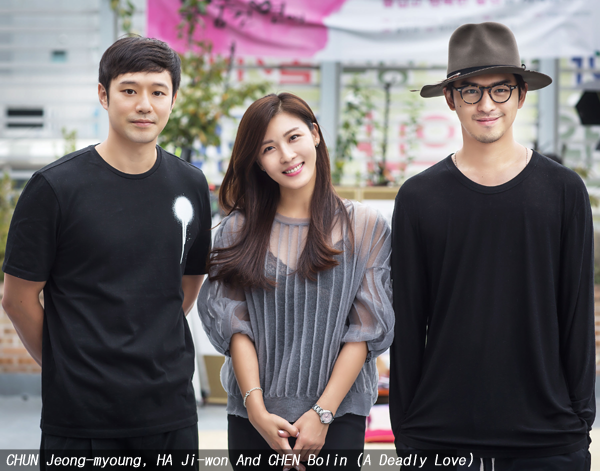 HA Ji-won has signed on for her first China-Korea co-production, A Deadly Love, which sees her feature alongside Taiwanese star CHEN Bolin, already a co-production veteran fresh off of Bad Guys Always Die, co-starring SON Ye-jin, which will debut at the Busan International Film Festival next month. A thriller with romantic elements, A Deadly Love began its three-month production schedule in the Itaewon neighborhood of Seoul on September 6th. HA is playing a mystery novel writer who is chasing after a long-time serial killer with her friend Rok-hwan, a detective. Their search leads them to the handsome and mysterious Jason, who will be played by CHEN. Joining the leads as Rok-hwan will be CHUN Jeong-myoung. Comedy and action star HA, known for Haeundae (2009), was most recently seen in Chronicle of a Blood Merchant, alongside HA Jung-woo. A Deadly Love will mark the directorial debut of SONG Min-kyu, who produced KANG Je-kyu’s war epic My Way in 2011. Also starring in the film will be How to Use Guys with Secret Tips (2013) lead OH Jeong-se and TV actress YUN So-hui.